The sky went a strange mustardy yellow-brown & the wind kicked up. 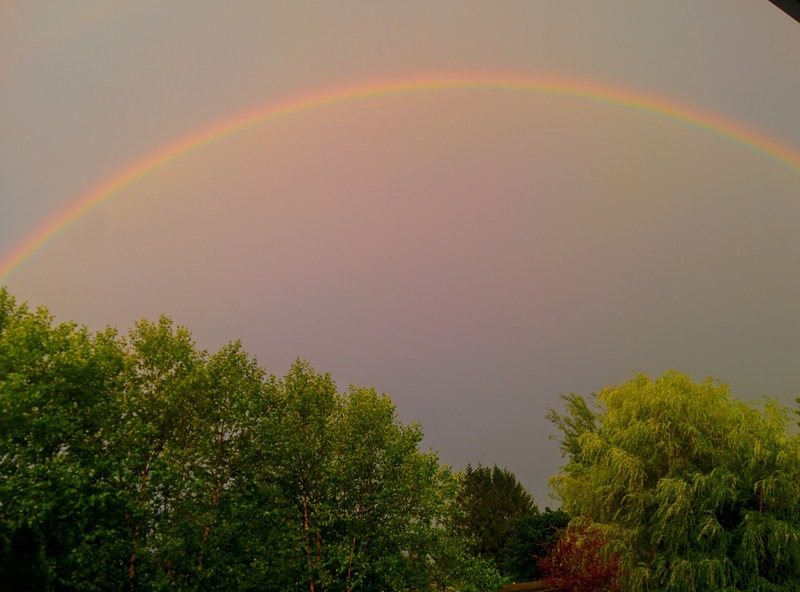 I thought for sure we were in for a monster storm, but then ... rainbow. While I thought that June's Spiced Pantry box was the first box I received in my subscription, I was very wrong. Apparently, I received a box in May which, in the hustle and freak out leading up to my surgery, was some how tidied away into the front closet. 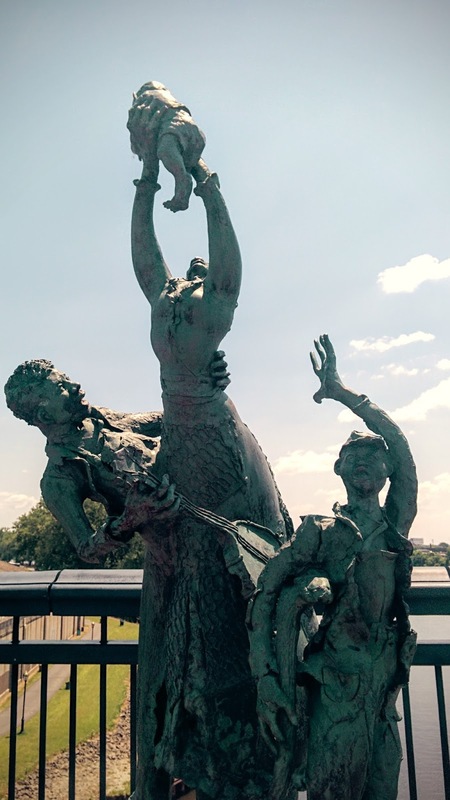 Stumbled across it while looking for something else entirely and was both astonished and chagrined. Happily, properly stored spices keep pretty well and I had no problem making a few of May's recipes! 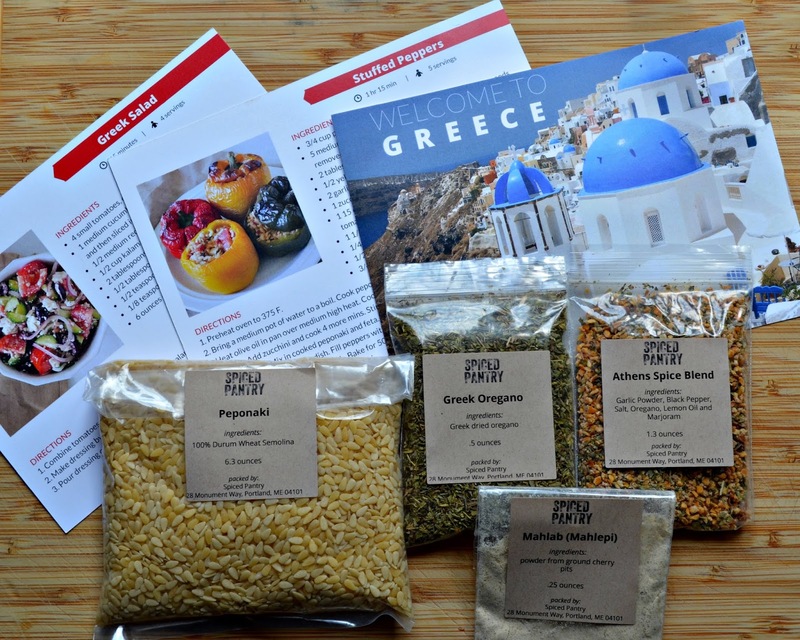 Spiced Pantry is a monthly food subscription box featuring a different cuisine each month. Every box includes four ingredients (custom spice blends, grains, legumes, etc), an information card introducing that month's cuisine and ingredients, and the recipes to make with them. Recipes usually serve 4-6 people so, if you are small household like mine, you can either expect leftovers or, you know, halve the recipes. 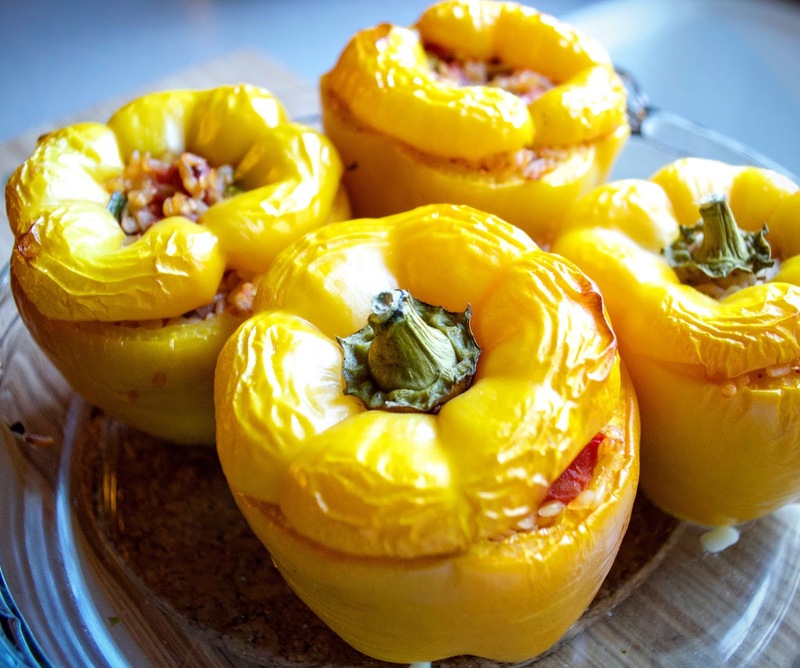 The peppers -- stuffed with al dente peponaki, onion, zucchini, tomato, feta, oregano and the Athens spice blend -- were pretty tasty and a nice change from the traditional meat-stuffed peppers I grew up with. They made for a filling vegetarian meal when paired with a light side salad and some toasted pita bread. (Or you could treat them like a side dish and pair them with kofta, which I also did). I'd definitely make these peppers again, although I'd use orzo since I'm too lazy to hunt down more peponaki. This salad -- chunks of farm-fresh crisp cucumbers, sweet tomatoes, and mild onion with salty feta and tangy kalamata -- was pretty darn delicious. So easy to make and so pleasing to the eye, as well. Made a wonderful supper paired with grilled steak and corn on the cob! 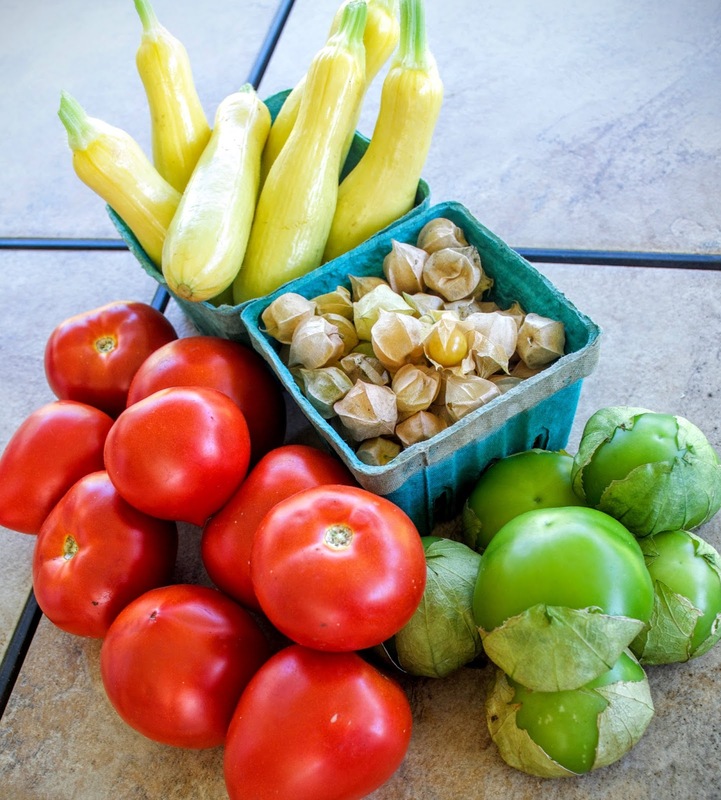 Definitely a salad to make as often as possible during tomato season. Can't wait to get cooking with July's box! ¡La Cocina Mexicana! 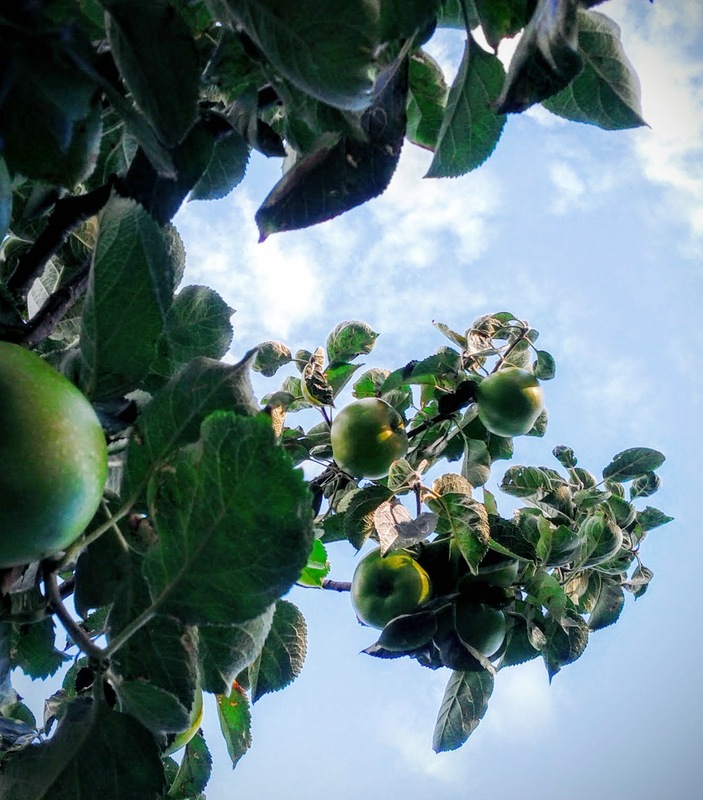 Green apples against a blue sky, with leaves limned in light. It's been waylongtime since I made my mom's "Oven-Fried Paprika Potatoes" but I'd picked some nice potatoes up at the farm stand and already had two really lovely strip steaks on hand, so ... it was Time To Revisit The Potatoes. 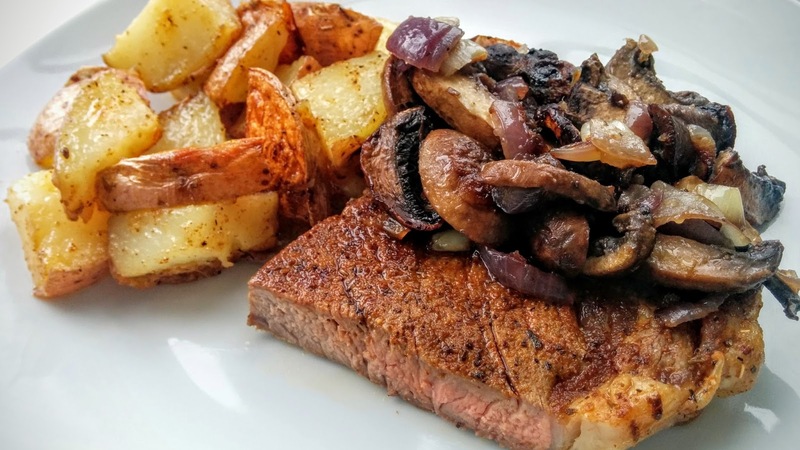 According to my blog post, the last time I made steak and oven fries, I cooked the steak at 400°F and the potatoes at 450°F. This confuses me, because the potatoes would have gone in first at 450°F and then ... what? When they were done, I let the oven cool down to 400°F and cooked the steak? This time, everything cooked at 450°F. Obviously, the potatoes need 50 minutes so they still went in first. 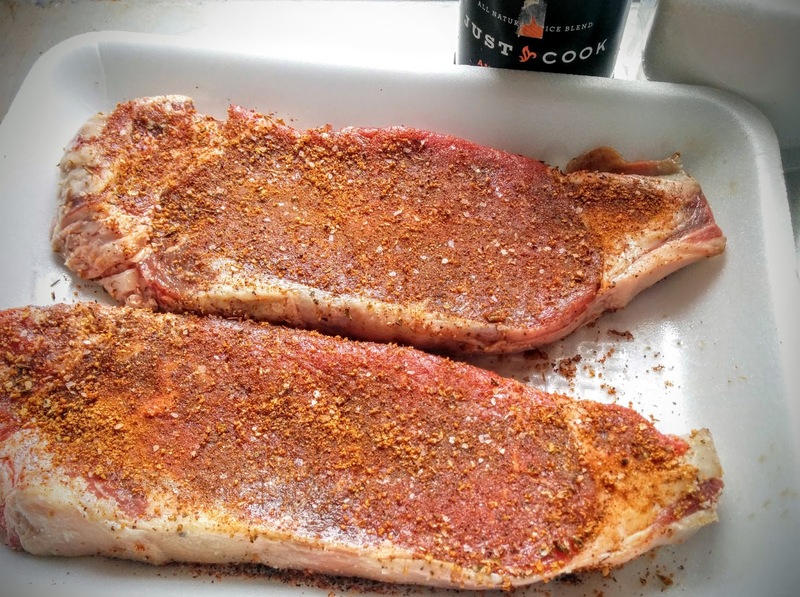 About 20 minutes before the potatoes were due out of the oven, I took the steaks out of the fridge rub, patted them dry with a paper towel and then rubbed them with Just Cook Foods' Ancho Chicken rub (despite its name, this rub works very well with beef and pork). Then I just left them alone. As the potatoes finished, I seared the steak in a cast iron skillet and then popped the skillet into the oven. Cooked the steaks for 2 minutes on each side, let them rest for 5, and ended up with two beautiful, perfectly cooked steaks with minimal fuss or bother. This is definitely a method I need to use more often! (We also had mushrooms with the steaks, of course. Just a foil pack of sliced mushrooms, red onion, a little butter, salt, pepper, and herbs, tossed in the oven just as the potatoes came out). 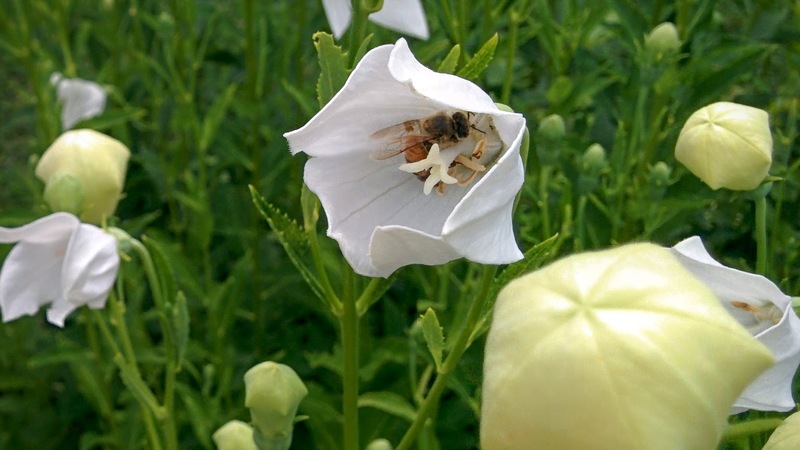 Wow, the summer has flown by! I can't believe it's time for the August Improv Challenge already! While I went sweet in July with peaches and cream, August is all about savory garlic and rosemary. I thought about baking a red onion, garlic, and rosemary focaccia -- like this -- because I'd like to ease back in to bread baking. And King Arthur Flour's "Garlic-Herb Mac & Cheese sounded pretty delish, too. But, in the end, I decided to take the easy road and roast some chicken breasts. 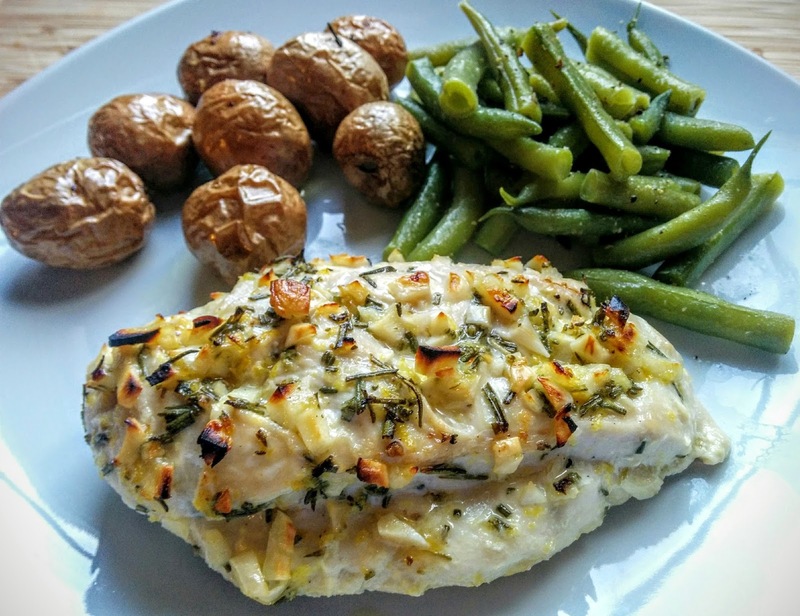 My first thought was to use split chicken breasts and slip a mixture of garlic, rosemary, and lemon under the skin before roasting, but then I forgot what I was doing at the grocery store and came home with a package of boneless skinless breasts. Whoops! 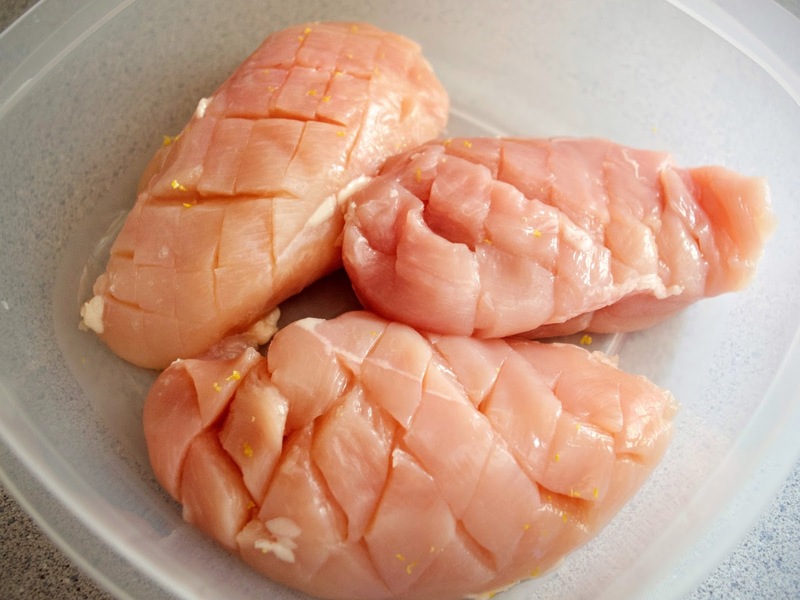 Since I find boneless skinless breasts need a lot of help, flavor-wise, I scored them each with a crisscross pattern, increasing the surface area available to marinade and more surface area means more flavor. (Also, I think they look prettier/more interesting that way). So ... how did it taste? Tasty. Succulent. Richly aromatic. A definite repeater. 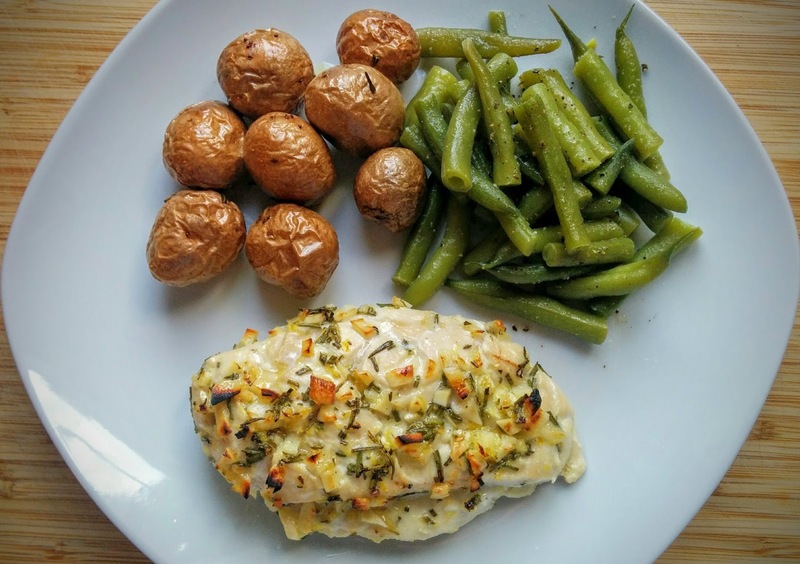 Pat the chicken breasts dry and score in a crisscross pattern with a sharp knife. Place in a food-safe storage container. Whisk together remaining ingredients and pour over chicken. Use a spatula or spoon to really work it into the crisscross cuts. Cover container and refrigerate overnight. Remove container from fridge and let stand at room temperature for 15 minutes. Pour chicken out into a baking dish and roast, uncovered for 25-30 minutes or until chicken reaches 165°F. Remove chicken from oven, tent loosely with foil, and let rest for 5 minutes before serving. 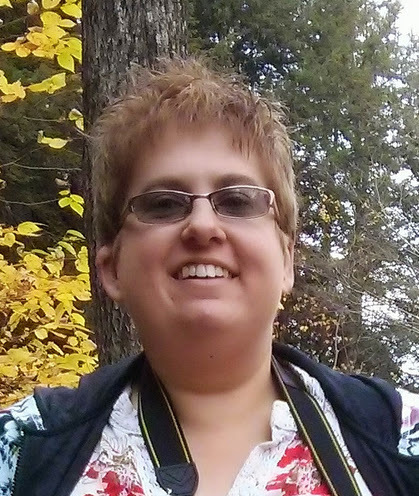 For anyone new to my blog, Improv Challenge is a monthly blog hop where two ingredients are assigned, participants must make a new-to-their-blog recipe using both ingredients, and publish a blog post about it on the third Thursday of the month. 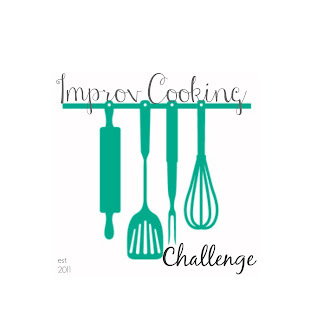 If you think that sounds like fun, click on the Improv Challenge logo below. Back in May, Crate Joy threw a flash sale with up to 50% off many subscriptions. I'd had my eye on the Spiced Pantry box since February (when I was looking for ramen subscription boxes for The Husband) but the price was a little high for me at the time. But half off six months of delicious spices? Of course, I signed myself up. 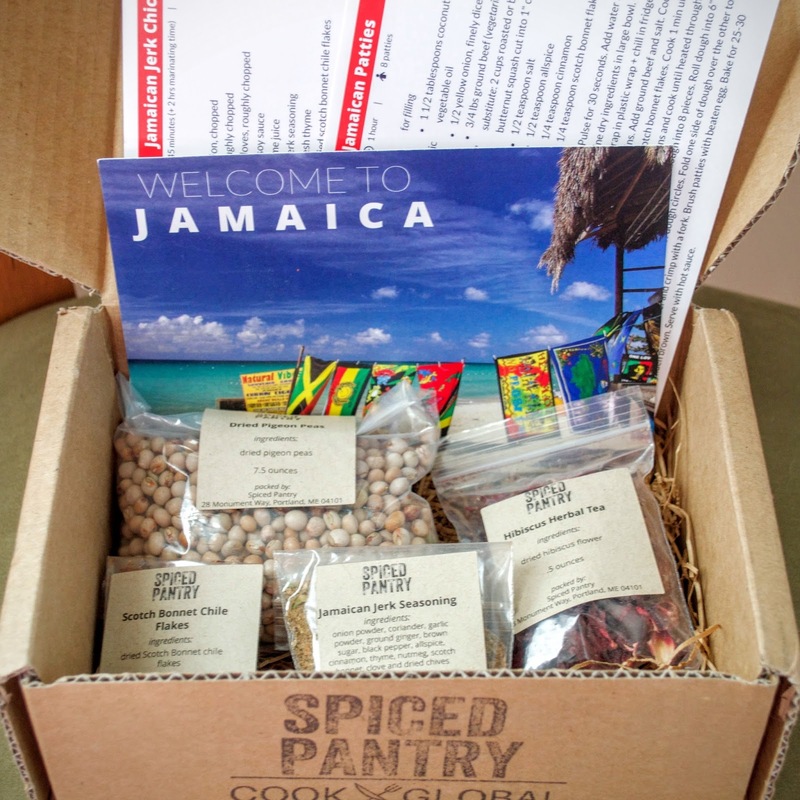 Spiced Pantry is a monthly food subscription box featuring a different cuisine each month. Every box includes four ingredients (custom spice blends, grains, legumes, etc), an information card introducing that month's cuisine and ingredients, and the recipes to make with them. One of the reasons I subscribed to Spiced Pantry was the opportunity to try new spices and ingredients without committing myself to store-size quantities. Each box comes with enough of each ingredient to make each recipe provided at least once, with extra for repeats, do-overs, or experimentation. 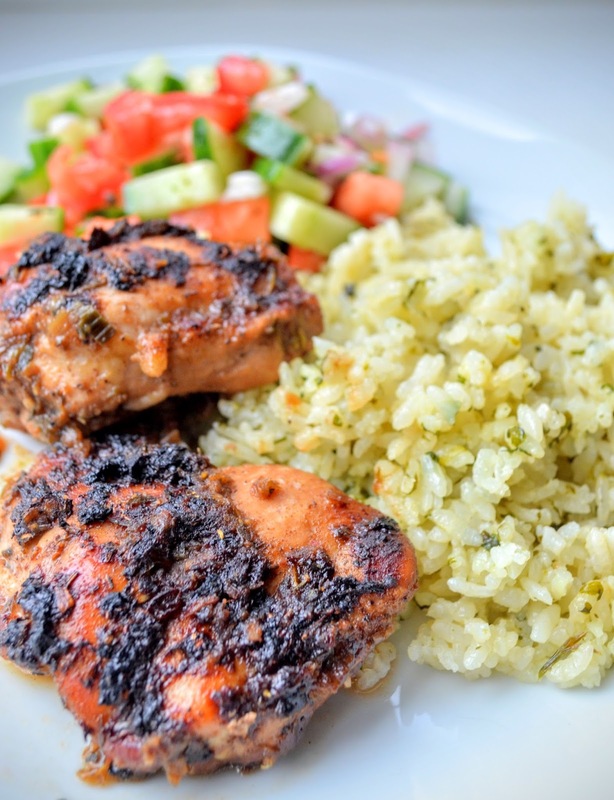 The jerk chicken smelled simply heavenly and came off the grill perfectly cooked -- moist, tender and full of flavor. It was a little hot for The Husband so I might dial back the scotch bonnet pepper flakes next time (oh, yes, this is worth repeating). I might also use just legs (thigh with drumstick attached) instead of a mix of pieces as it's easy to grill all one cut. Had intended to serve my jerk chicken with the rice and peas, but found I couldn't manage both dishes at the same time. Instead, I served my chicken with medium-grain white rice mixed with a liberal amount of cilantro and lime. Also the usual cucumber and tomato salad, because that's our go-to side. Slightly tart and very refreshing, the hibiscus tea hits just the right balance between floral and spicy with just a little gentle heat from the ginger and cinnamon. 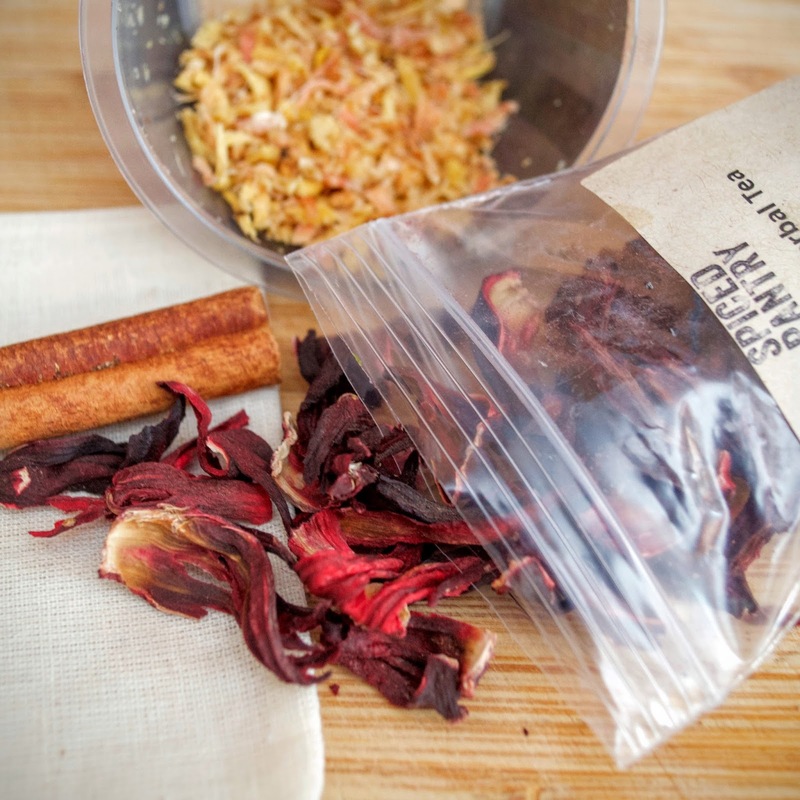 I had only one empty pitcher on hand when I made this tea so I put the hibiscus flowers & ginger in a spice bag to avoid needing to strain or decant the tea after brewing (the cinnamon stick was big enough to be easily fished out on its own). As you can see, my patties are more angular than rounded as I am not very skilled at rolling out dough circles. Despite their homeliness, the patties were surprisingly good for a first attempt. The filling need more flavor (and some sauce, maybe, as it was rather dry), but the pastry was wow. The recipes provided by Spiced Pantry were clear and easy to follow, the amount of ingredients provided was just right, and the quality seemed high. All this resulted in dishes that were quite delicious and worth making again. Overall, I had a lot of fun creating June's dishes and look forward to exploring the tastes of México with July's box! The Husband surprised me with a big bag of cherries. He doesn't even like cherries, but he knows I do and he is a kind person, so cherries. So. Many. Cherries. I ate them every day, but the bag never seemed to empty and the cherries would not stay at peak edibleness (edibility?) forever ... what to do? Pie was out of the question, as I was not up to baking one and who would I share it with, if I could? I can't probably shouldn't eat a whole cherry pie on my own. 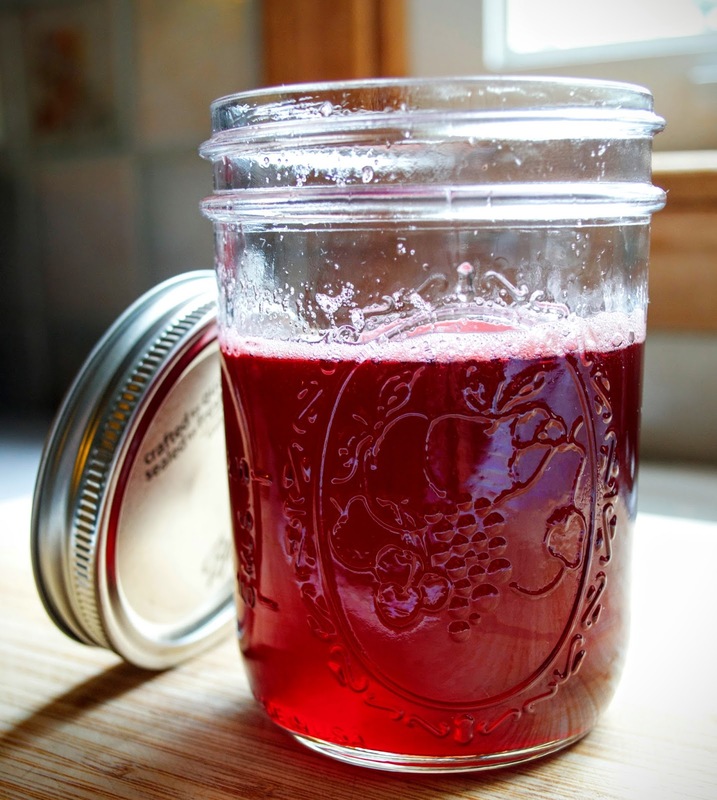 And then I stumbled across Arlene Mobley's recipe for "Cherry Simple Syrup" on Community Table and it turned out to be exactly what I was looking for. Four ingredients. A few simple steps. An amount of syrup that wouldn't overwhelm me. The syrup is delightful. It was easy to make, minus the boil over that made a sticky mess on my stove top and was entirely my own fault for not keeping an eye on things. 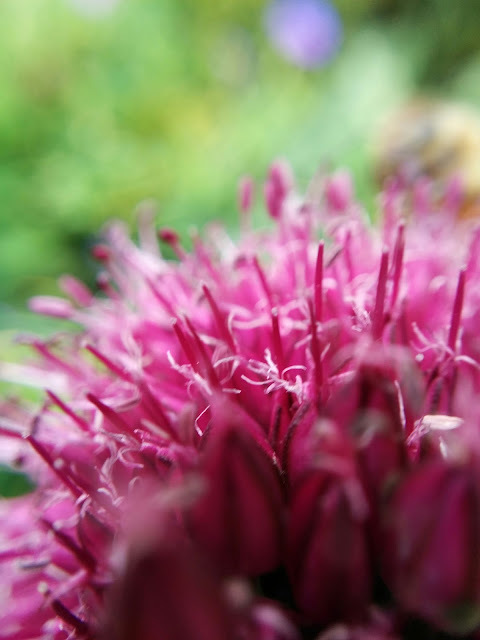 Beautifully red, it tastes like unadulterated summer in a jar and the heady aroma of it! One whiff of it brings me back to my Grandma G's kitchen, where she always seemed to have a cherry pie waiting. I did end up cooking my syrup just a wee bit longer than Mobley's recipe directs, because my syrup seemed too thin. An extra five minutes on the stove gave me what I was looking for -- a syrup that coated the back of my wooden spoon. Chilled, the syrup now has the constancy of, say, an undiluted squash or fruit cordial. 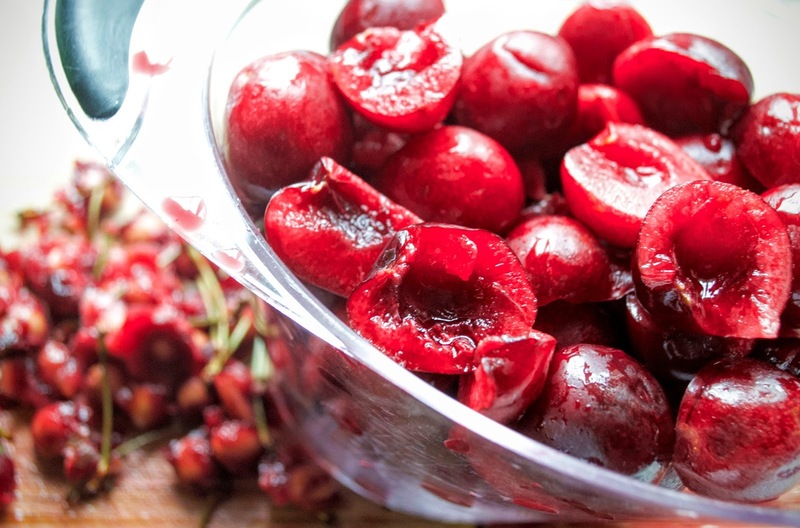 Simply tossing out the drained stewed cherries seemed wasteful so I ate them, warmed, over plain Greek yogurt for breakfast and, ohhhh, DYNAMITE. Probably also fab on vanilla ice cream or ricotta toast, but they didn't last long enough for me to find out. What can you do with this syrup? Well, I've been adding it to lemonade as well as unsweetened green and black iced teas. I've also tried it in Sprite Zero with a bit of lime -- a kind of bastardization of the Shirley Temple or Sonic's Cherry Limeaid, I guess -- and it was surprisingly bright and refreshing. (I mean, I'd certainly expected it to be good, but not so good I'd want a pitcher of it). 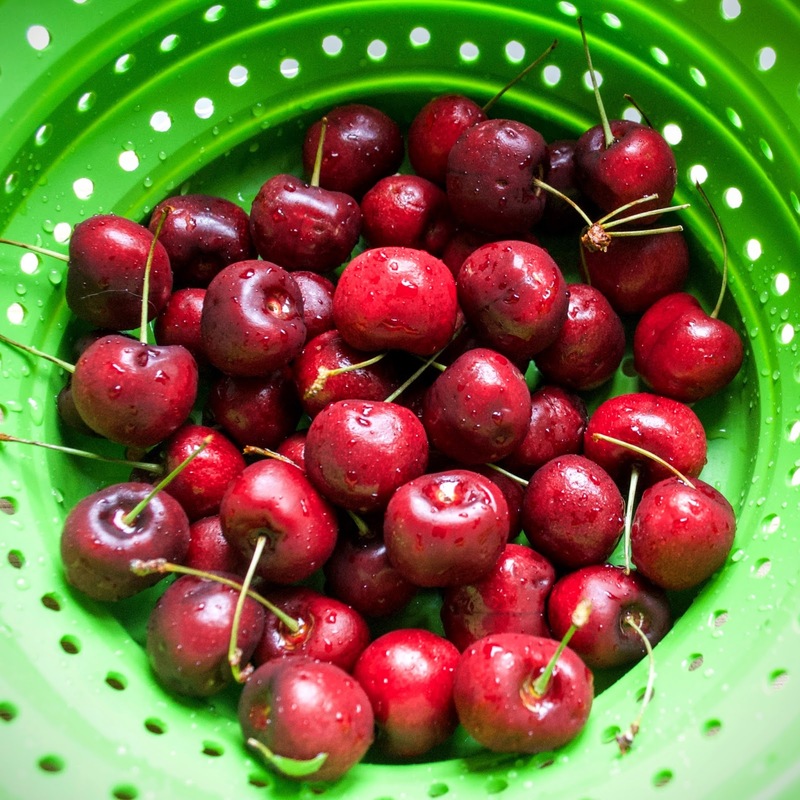 Have you tried pitting cherries with a straw? I see that trick mentioned a lot, but I've had not luck with it. I just used a knife to pit these cherries -- ran my knife around each cherry and split it in half, then popped the pit out with my thumb. It was a little messy, yes, but cooking usually is. 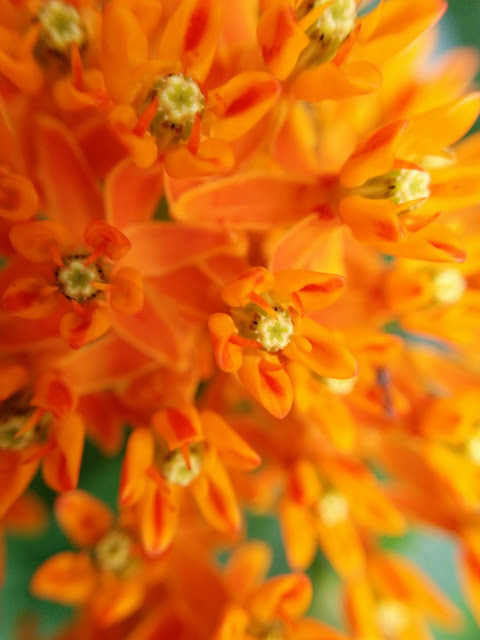 Playing around with the clip-on macro lens I picked up for my Android phone during Amazon Prime Day. I'd bought a mixed bag of lemons and limes, because the price was very nice and thought I would use far more of them in cooking and baking then I actually did, so I ended up with a bowl of wonky looking citrus giving me the side-eye every time I went into the kitchen. Obviously, something needed to be done. Well, when life gives you wonky lemons (and limes), make lemonade. I used Imperial Sugar's "Old Fashioned Lemonade" recipe as my guide, but reduced the sugar to one cup. The lemonade had a very bright, sweet-tart flavor that kept us coming back for more. My lemon has a heart! And then that was it. No more home-made lemonade. Back to the Farmer's Cow, I thought. The Farmer's Cow makes perfectly yummy lemonade -- The Husband is partial to strawberry, but I totally ❤ watermelon -- and buying it supports local agriculture and business. Meaning, I get to feel extra virtuous while being a lazy cook. Except. While The Husband, who functions as The Shopper of Groceries & Carrier of All That Is Heavy since my surgery, has been buying Farmer's Cow lemonades he also keeps bring home bags of lemons. Because he wants more lemonade. Oh, sweet lemonade. So I keep making lemonade. It's actually the perfect cooking activity for me, right now, as lemonade don't care how long it takes you to make it. Need a little sit down after juicing the lemons? That's fine. Because I can't leave well enough alone, I had to fancy up this recipe and make blackberry lemonade. (Also, the blackberries were in danger of going off). 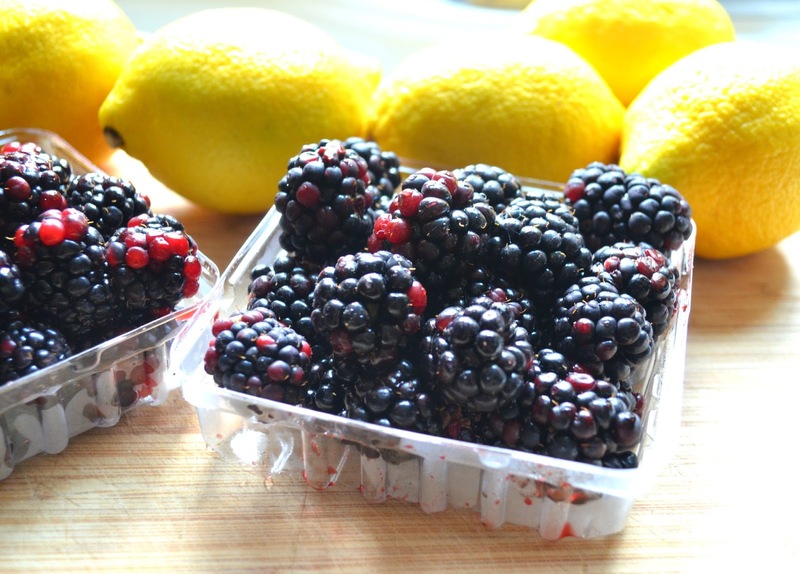 Blitz sugar and blackberries in a food processor or blender until a smooth puree forms. Press puree through a sieve into a large pitcher. 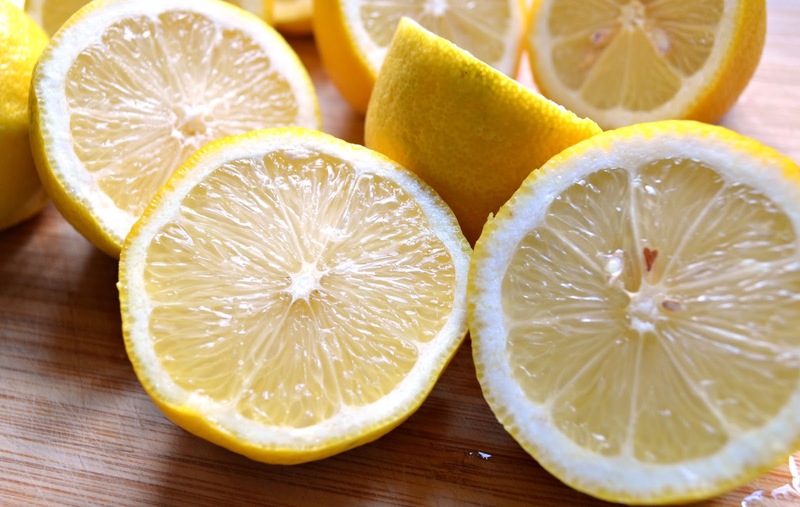 Add lemon juice and water, stir well, and taste. Add additional water or sugar, if needed. The ripeness and relative size of your fruit will determine how much juice you get, which will effect the amount of sugar you'll want to use. One cup usually works just fine, but sometimes the blackberries aren't so sweet and need a little boost.